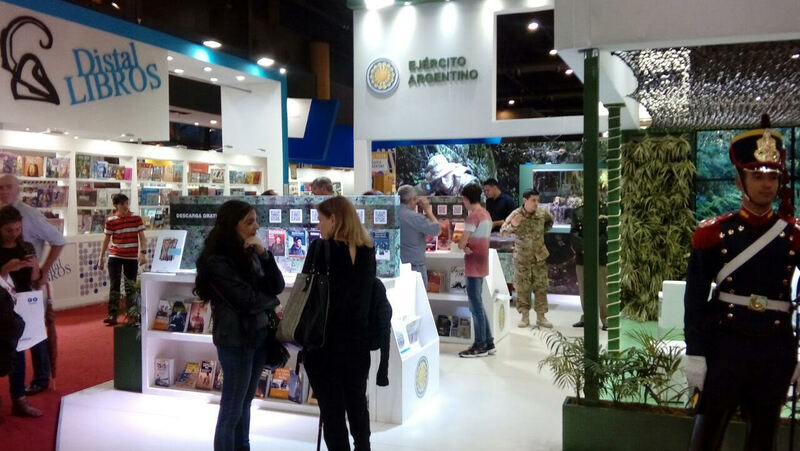 Between April 26 and May 14, 2018, the 44th International Book Fair of Buenos Aires was held at La Rural Fairground. 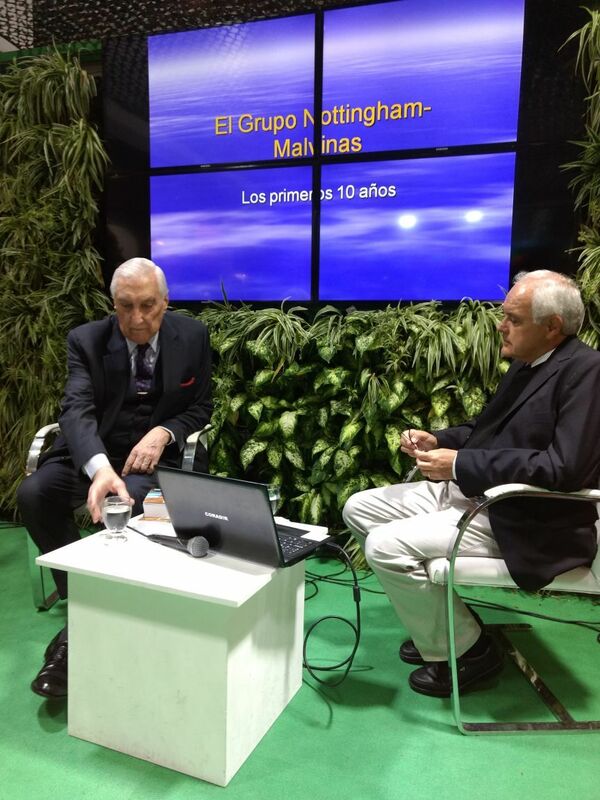 On May 8 (Day of the Virgin of Lujan) the book The Nottingham-Malvinas Group : The first 10 years was presented. Today it is an honor to have among us the presence of Mr. Horacio Calderón, outstanding writer and International Analyst, and Dr. Eduardo Gerding, author of the book. It´s been 36 years since the end of the South Atlantic War where a generation of Argentines fought with courage for a national integration. This afternoon we are going to present the book The Nottingham-Malvinas Group. This book, edited by the Círculo Militar provides a detailed analysis not only of some battles fought in the Malvinian peatbut also of different approaches to deal with the war veterans´aftermath . I am going to leave the word now to Colonel Urricariet , Director of the Military Printing House. 44th International Book Fair of Buenos Aires La Rural Fairground- Argentine Army stand. Colonel Urricariet said: The book that we are going to present and[ ] I am going to make an extreme synthesis- is a very important treatise of ten chapters that includes ten years of work of this group. It describes the main pathologies observed in the Argentine and British war veterans previously published by the author in different journals among them the International Review of the Armed Forces Medical Services (Hôpital Militaire Reine Astrid, of Brussels-Belgium). The presentation of the book was in charge of Mr. Horacio Calderón, Expert in Middle East and North Africa Affairs ,Counter Terrorism Specialist and collaborator of CNN in Spanish. During the Malvinas Conflict he was appointed by the Commander in Chief of the Argentine Navy for the fulfillment of an important series of secret intelligence missions and procurement of material support. 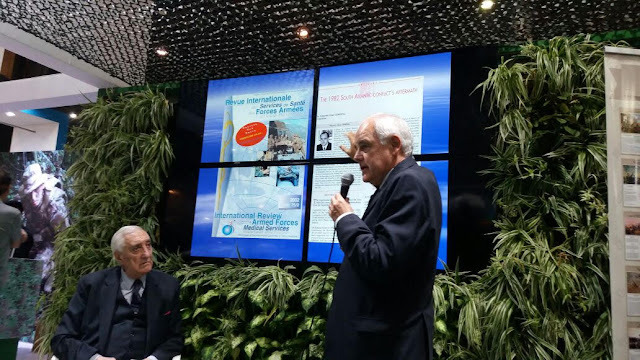 Mr. Calderón said: "Well, first of all, I want to thank the Argentine Army, through its General Secretariat, for having nominated me for the presentation of this excellent book called the Nottingham-Malvinas Group. Also thank the Editorial 1884 of the Military Circle and my friend of many years Alejandra Buceta who is a true expert in everything concerned with editing. At her request I won´t say how long we’ve known each other. I would especially like to thank Colonel Urricariet for his introduction and of course to this evening´s star Dr. Gerding for letting me introduce this wonderful book. We really do not finish learning new things about the Malvinas war. I also want to highlight two presences: one from a friend whom I presume has been suffering me for about 60 years : Marine Corps Captain Miguel Pita a dear friend who was also Deputy Chief of Staff during the disembarkation in our islands. Another dear friend: Captain Juan Membrana with whom we shared meetings talking about what one can do (or allowed to do)in our country, regarding the national defense and our Armed Forces. Our Armed Forces are the first and I think the last line of defense in what has been left of national integrity. My answer was that, over the course of time, those who have somehow been involved in this conflict feel more connected to each other, than to the political leaders of their respective countries.I feel empathy for this. After the conflict, I felt much more honored shaking hands with an enemy leader than shaking hands with those who received our military as if they were ghosts hiding them from the public. Nothing was known about these combatants for a very long time. I have great empathy for Dr. Gerding for whom, because he is a medical doctor who has been Head of the Gastroenterology Department at the Buenos Aires Naval Hospital. He had nearly the same functions than my father who was a Navy doctor and served in the old Naval Hospital. At the Naval Hospital my sisters were born, my grandfather died and I was submitted to surgery five times once as the result of a gunshot wound. So I feel a special connection which started when reading this excellent book. This book has several story lines. Many of them sincerely unknown to me. Somehow those of us who have not participated in the war, as is my case, but abroad in matters of intelligence, we never got to know the details of what happened. One of the themes that Dr. Gerding raises is precisely the physical and psychological war traumas. Not only the traumas when we have an ongoing war but also what happens when it ends; the traumatic effects. (If I make a technical error, please tell me, Dr.). There are so many elements that surprise is a constant feature. In Argentina we do not know with certainty how many soldiers lost their lives and how many others committed suicide as a result of war. About 254 British died during the war but those who committed suicide are probably more than those KIA. This is one of the most interesting points addressed byDr. Gerding´s excellent book. It even brings unknown statistics and up to date information we previously ignored. It also depicts Argentine and British protagonists on whom Dr Gerding focuses. One may perhaps know the name of the Gurkhas´commander or be unaware that a unit was named after Prince Philip of Edinburgh. In short there are so many details. In this book we access testimonies of Argentine high and medium rank officers who took part in the conflict. Another interesting question that Dr. Gerding addresses is how the combatants were treated from the medical point of view in Argentina and Great Britain. I was surprised by the certainty with which he addresses methodologically and accurate each of its aspects. He equates for example the Argentine PAMI ( we are familiar with its story …) with what would be the NHS (the British PAMI). One would think: we should imitate the British PAMI to improve our services in Argentina. Not quite. A post-war patient in Britain had to wait a year or more to consult a specialist. Note that here in Argentina, thanks to Dr. Gerding who had a very high role in the PAMI, (I think he still has it; he may be retired, but I know that he is constantly consulted) things have improved. Another issue for example is what happened to the British military? What do we know about their lives? . We´ll find very interesting things. I won´t keep talking otherwise you won´t buy the book and Dr. Gerding will bill me and the Publisher. I was really surprised by the fact that the Argentine soldiers in the Army, the Navy and Air Force and those who fought in another type of discipline as well as me have been ignored . Well, what about the British? Well, they've been a lot worse than us. When I speak of us I mean those soldiers who even today are incapacitated and are not receiving proper assistance. Well, in Britain it has been worse. These are things to be improved.Being a hypochondriac as a good doctor´s son , I was very interested in Dr. Gerding's academic exposition of how to avoid, for example, in any future war (which hopefully we won´t have to fight ), the infamous trench foot and the issue of inadequate clothing. We are talking about booties, stockings and everything that means to protect the combat capacity of the soldiers. A frozen soldier is a soldier who cannot fight. Dr. Gerding recounts previous wars, world wars and the Russian front, where many of the casualties were due to the freezing feet in the trenches. Dr. Gerding also talks about reconciliation. "I read this book in 4 or 5 days because I was riveted. Some historical details of Malvinas are not known .The people who have been involved in the war- as could be the case of Captain Pita and others with whom I have been able to talk- are reluctant to remember those tragic moments that Argentina endured. I am proud to be an Argentine and I am proud of those who fought for the Argentine Nation for these islands. I can criticize the strategy that did not exist and the lack of joint action but one has to acknowledge the sacrifice of our soldiers and those who, being alive, remain with little assistance from the authorities. . So, Dr. Gerding, I look forward to your presentation. From left to right: Mr. Horacio Calderón Expert in Middle East and North Africa Affairs , Counter Terrorism Specialist and collaborator of CNN in Spanish and Dr. Eduardo Gerding. 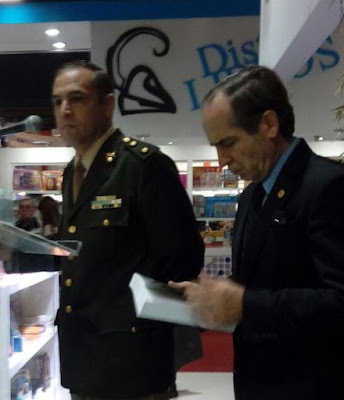 The author at the beginning of his lecture paid homage to two very dear people who died during the year : Marine Corps Captain Carlos Alberto Bouvet (Director of the Azopardo Naval Arsenal in 1982) and almost a brother: Engineer Juan Esteban Roach Fitzpatrick. He also emphasized that this book could be published thanks to the support and enthusiasm offered from the beginning by Colonel Urricariet and Mrs. Alejandra Buceta, both from Editorial 1884 (a 134-year-old publishing house). In the first row of the large and young audience was Marine Corps Captain (Ret)and war veteran Miguel Carlos Augusto Pita. Captain Pita attended the Amphibious War College with the US Marines. He finished his stay in the Operations Area of ​​the 2nd division at Camp Lejeune in North Carolina. In 1982 he served as Commander of the Marine Infantry Brigade No. 1. His final Marine Corps position was at the Intelligence Headquarters of the Joint Chiefs of Staff. Naval aviator Captain (Ret)and war veteran Juan José Membrana was also present. The latter carried out 11 missions between March 28 and June 14, 1982 half from the aircraft carrier ARA 25 de Mayo and the other half from Río Gallegos, with the aircraft Grumman S-2E Tracker. He was also Aircraft Commander and signalman carrier. The first slide of the author's PowerPoint was the image of Professor Bernard McGuirk and his book Malvinas-Falklands: An Unfinished Business. The last was theDuke of Wellington´s (1769-1862) historical words: Believe me, nothing except a battle lost can be half so melancholy as a battle won.